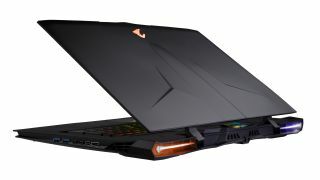 Gigabyte has unveiled a powerful new gaming laptop which derives its pixel-pushing prowess from dual GeForce GTX 1070 GPUs. The new Aorus X9 boasts an Intel Core i7-7820HK quad-core processor (base clock 2.9GHz, with Turbo to 3.9GHz) which can be overclocked, and as mentioned, a pair of GTX 1070 graphics cards hooked up in SLI (with 8GB of video memory each). That chunky core spec is backed by up to 64GB of system RAM, and for storage, you can specify a pair of M.2 PCIe SSDs (maximum capacity 512GB each) alongside a traditional hard disk (up to 2TB). For the 17.3-inch display, you can either run with a 4K IPS panel that offers 100% Adobe RGB coverage, or a 2,560 x 1,440-resolution screen with a refresh rate of 120Hz and a 5ms response time. The X9 also benefits from a mechanical keyboard which is backlit with 16.7 million colors to choose from (and per-key lighting). Finally, it’s worth mentioning that Gigabyte has worked hard on the cooling system to keep all these peppy components from any danger of overheating. That means the laptop has large cooling vents, four fans, and eight heatpipes. Availability is to be confirmed, and pricing will start from $3,199 (for the non-4K version), which is around £2,430 or AU$4,070. That’s not cheap, but powerful gaming laptops never are. The best you can hope for is a good deal on a gaming portable come Black Friday, perhaps. If you're in the UK, remember to check out our Black Friday deals to make sure you don't miss out. There's sure to be some bargains during Black Friday in the US and Black Friday in Australia as well. We’ll be getting the Aorus X9 in for review soon, and can’t wait to get stuck into some benchmarking with this powerful laptop. Meantime, check out our hands-on with the laptop back at CES.